Betty James was born on February 13, 1918. She spent her childhood in Altoona. She loved to play when she was a little girl. Betty went to Altoona High School. After graduation, she attended Penn State University for two years. In 1940 Betty married Richard James. Richard worked for the Cramp Shipyard in Philadelphia. He was a mechanical engineer, a Marine architect, and a naval engineer. He was working on a project to find a way to keep instruments steady on a rocking ship. He was testing different types of springs to see if they would hold the instruments still. One day one of his springs fell off a table, and bounced around. Richard was excited about making a toy out of a spring. He wanted to make it walk down stairs. Richard took the spring home, and showed it to Betty. He worked on getting the spring to do what he wanted, while she searched the dictionary for a good name. Richard perfected the spring. Betty found the Swedish word “Slinky.” It meant stealthy, sleek, and gracefully flowing. They decided to use this word to name their toy. Richard got a patent for his product. A spring sitting in a box does not look very exciting. The James’s wanted to demonstrate it for people to see. One cold, miserable November night in 1945 they were allowed to put on a demonstration at the Gimbels Department Store in Philadelphia. They had 400 Slinkys to sell. Richard was afraid that no one would buy one. He gave a friend a dollar and asked him to buy a Slinky. Richard didn’t need to worry. People who saw the Slinky loved it. The 400 Slinkys were sold in 90 minutes. After that, many people wanted Slinkys. They were very popular at the 1946 American Toy Fair. Richard and Betty borrowed $500.00 to found James Spring & Wire Company. They mass-produced Slinkys using a machine that Richard had engineered and built. 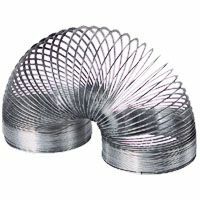 Slinkys were made of 80 feet of Swedish steel wire. In 1956 the company changed its name to James Industries. Richard moved to Bolivia in 1960. Betty and their six children remained behind. Betty struggled to pay all the bills and keep the business going. She needed a less expensive location for the factory. She moved the Slinky factory from Philadelphia to Hollidaysburg, a small town in the western part of the state. The town welcomed the new business. Betty was a good businesswoman. She cut costs by switching from the blue-black Swedish steel to a less expensive, silvery metal made in America. A catchy advertising jingle stuck in peoples’ minds. Soon there were other Slinky toys. Slinkys made of plastic were good for younger children. They could be made in a bigger size, and did not tangle as easily. The Slinky Dog , Slinky Pets, and Crazy Eyes (eyes on the end of slinky springs attached to a pair of glasses) sold well. Slinkys are still manufactured in Holidaysburg. The factory uses Richard’s original machinery. Slinkys are almost exactly the same as they were when they were first made. In 1973 the ends of the Slinky were crimped to keep children safe from cuts. The Slinky may be a toy, but it has been used for many unusual things. Soldiers in Vietnam found that it made a very good radio antenna when slung into a tree. It has been used to help people develop coordination. Students have used Slinkys to imitate sound waves in Physics class. Slinkys have even been used to pick pecans. When Walt Disney Studios made the movie Toy Story, they used the Slinky dog as one of the characters. The Slinky is now so well known that it is in the National Toy Hall of Fame ® at Strong Museum, Rochester, New York.